Many local residents may recognize the gentleman in this Victorian portrait as Benjamin Franklin Gilbert, the founder of Takoma Park. But what is the rest of the story? Why did he chose this particular corner of the District of Columbia for his sylvan suburb. What were the challenges involved in bringing his vision to life? On November 24, 1883 Benjamin Franklin Gilbert takes title to roughly 90 acres of land surrounding the Brightwood station on the Baltimore and Ohio railroad line heading north out of Washington DC. In exchange for $7500, he acquires a tangle of mostly unoccupied land lying half in the state of Maryland and half in the District of Columbia. Gilbert, 42 years old, is a prominent player in the Washington real estate market. For many years he has been trying to convince fellow developers like Alexander Shepherd and Brainard Warner that the future of Washington real estate lies to the north. Time to put his theory to the test. The train station itself is factor number one. Daily rail service gives the increasing number of federal clerks a new option. They can move their families away from the crowded unhealthy downtown to the rural pleasures six miles north, while remaining within an easy 20 minute commute from their jobs. As Gilbert points out, owning a home is cheaper than renting one. The land also attracts him. It is high ground compared to the malaria-breeding marshland where the Federal City sits. Trees provide shade, underground springs offer clear cool water, and daily sightings include birds and wildlife. But first Gilbert must carve streets out of the tangle and subdivide the untamed landscape into tidy plats for eager buyers. Several friends pick out their sites the same day he signs the deed. By spring, the sounds of house construction fill the air. Gilbert recruits several master builders to take up residence so they are on hand to erect houses for future arrivals. As proof of his commitment to the venture, he brings his family to live alongside the first settlers. Rave newspaper reviews and Gilbert's own illustrated promotional brochures spark interest in the suburb he has renamed Takoma Park. An Evening Star ad in 1889 lists 235 owners of lots. Planning for the future, Gilbert generously allocates space for parks in new subdivisions, donates land for a community church at Maple and Tulip Avenues, and pays for street improvements from his own pocket. One small quirk is his insistence that all deeds include a clause barring sale and manufacture of alcohol, reflecting his long-held temperance beliefs. In 1890, residents ask the Maryland State Assembly for formal incorporation as a town. The State agrees — but at great price — the town boundaries exclude land in the District, disenfranchising half the community. Gilbert prevails in the first election, taking the mayor's chair, but he holds office just over two years before stepping down to address business difficulties. He never recovers from the Panic of 1893 and a stroke in 1901 saps his health. 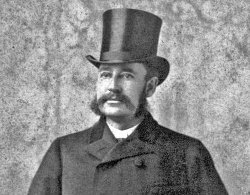 Gilbert dies on April 17, 1907, his fortunes diminished but secure in the knowledge that the sylvan suburb he established is on solid ground. The short biography of Gilbert, written by his daughter (Margaret Jamison Gilbert) for the 1933 semi-centennial booklet, which includes some hard-to-verify assertions.